Combine dried fruit, onion, and balsamic vinegar in a small microwaveable bowl. Cover and microwave on medium setting for 1 minute. Remove from microwave and stir in pine nuts; let sit, covered, while fish is cooking. Fill a 12-inch skillet with water to a depth of 1-inch and bring to a boil. Rinse any ice glaze from frozen Alaska Cod under cold water; place fillets in steamer basket. Season with salt and pepper. Turn off heat. Place steamer basket into skillet; return liquid to a boil. 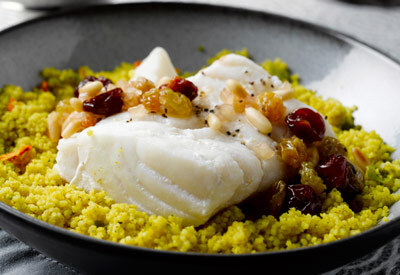 Cover loosely and cook 5 to 7 minutes for frozen cod or 4 to 5 minutes for fresh/thawed fish. Cook just until fish is opaque throughout. Remove fillets to serving plates; top with fruit. Cook's Tip: This recipe works with any dried fruit -- use your favorite! Delicious with either a spinach salad or couscous!